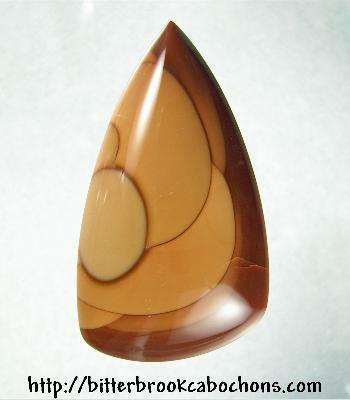 Oh by gosh by golly, it's almost time for Mistletoe and... Bruneau Jasper! This is one of the two prettiest chunks of Bruneau I've ever cabbed. It's big, and thick, and will make an awesome pendant. Yes, that's a fracture you see at lower right; it's tight and stable, however. The rest of the flecks you see are spurious reflections from my photo setup. 51mm x 29mm x 10mm. Weight: 101.10 carats.